These days, everyone wants to talk about what they would do if there was a zombie apocalypse. Of course, this question cannot really be answered without first answering a few other questions: are these slow zombies (Night of the Living Dead) or fast zombies (28 Days Later), fresh bodies only (Night of the Living Dead) or ancient corpses (Zombie 2) or even evil Knights Templar (Tombs of the Blind Dead), flesh-eaters (Night of the Living Dead) or brain-eaters (Return of the Living Dead), and is this a case of “kill the head, kill the ghoul” (Night of the Living Dead) or do all the severed body parts keep coming back for more (Evil Dead)? Is an Australian ghost fond of Fruit Roll-Ups? Or is it just a coincidence? Three sets of security cameras in an Australian IGA grocery store caught some unusual activity recently. Out of the blue, a box of Fruit Roll-Ups seems to be thrown from the shelves at the front of the store. The store's owner had been previously warned that the store was haunted, and the Fruit Roll-Ups aren't even kept in that section. Is this the work of a poltergeist, or something else? The facts of the case: the supermarket stocks the Fruit Roll-Ups at the far end of Aisle 2 (at the back of the store). However, the box in question came from the near end of Aisle 3 (at the front of the store). This is a distance of 6 meters (almost 20 feet), and around a corner. Leave it to Oprah to revive an old trend! Oprah lit up the internet last night when she discussed, on her network (OWN, the Oprah Winfrey Network), her fondness for transcendental meditation. This practice, which for many people is strongly associated with the 1970s, seems to be undergoing a resurgence in recent years. A lot of ridiculous claims have been made about TM over the years. For example, that any town with a certain percentage of TM enthusiasts becomes a "haven from crime," with a zero unemployment rate, and crops that grow like gangbusters. Or that if you practice long enough (and pay enough money to your yogi), you can learn to literally levitate when you meditate, hovering several inches above the ground. Read more about Transcendental Meditation, A New Fad? It was difficult to tell where the noises were coming from. Sometimes they sounded like "rattling pipes," other times like "distant thunder." Sometimes they were accompanied by a rattling or shaking of the earth, although it was difficult to tell which came first. Were the noises making the earth tremble, or vice versa? The U.S. Geological Survey has finally solved the superficial mystery: the noises were due to a "swarm" of shallow surface earthquakes. These earthquakes caused a variety of noises, depending on what they were shaking at the time. And obviously they would account for localized trembling of the ground, as well. If you've never heard of puckwudgies, you probably don't live in southern New England. Many cultures all over the world have fairy and goblin legends of their own, and the Native peoples of southern New England are no exception. Puckwudgies are goblin-like creatures that are supposed to haunt the Freetown-Fall River State Forest as well as other forests and swamps in the region. They are described most often as little men with gray skin, although they are also said to take other shapes sometimes such as that of a porcupine-like creature. Emails from beyond the grave? "It seems that Froese might have been displeased by his untimely death, as well." Everyone who has lost a family member hopes for some sign from the dearly deceased that they’ve made it elsewhere, that they’re in a better place. Most of the time, we’ll find signs in random or mundane occurrences just because we some sort of guidance so acutely. But for the friends and family members who knew Jack Froese, no searching for signs was necessary. They got concrete emails instead. Read more about Emails from beyond the grave? Russian media mogul Dmitry Itskov's side-project? Building robots capable of sustaining a human brain...indefinitely. Oh, those uber-wealthy Russians. Always coming up with incredible (incredibly unrealistic) schemes into which they can dump their money and boredom. One of the most recent ideas to come out of Mother Russia is, what else, immortality. In this case, a 31-year old Russian media mogul by the name of Dmitry Itskov is funding an incredibly ambitious project to create a robot that could house and sustain a human brain, preserving its consciousness in perpetuity. A recent feature in Gizmodo outlines Itskov’s plan to create this man-bot in as little as one decade. "This project is leading down the road to immortality,” Itskov told Gizmodo. “A person with a perfect Avatar will be able to remain part of society. People don't want to die.” Itskov, owner of the online news outlet managing company New Media, has made millions from his online ventures. With the fortune he’s made from New Media he claims to have hired 30 researchers from inside Russia for his sci-fi-sounding project, but now wants to outsource the work to the larger global scientific community. He announced his plan at Global Future 2045, a convention of futurists hosted in Moscow. Itskov’s plan is to develop the robot in stages, starting with robotic components that can be manipulated by the human mind. The first stage, at least, is feasible with other researchers in other parts of the world already having created robotic arms controlled by the minds of Chimpanzees. Johns Hopkins University has also develops artificial limbs that are controlled by paraplegic patients. Email From Beyond The Grave? Last June, a British man named Jack Froese suddenly died at the age of 32 of a heart arrhythmia. Six months later in November, the BBC reports that several of Froese's close friends and loved ones received emails which seemed to come from his account. More mysteriously, several of the emails had content that Froese had only discussed with the recipients in the days and hours right before his death. For example, shortly before Froese's death, he and his childhood friend Tim Hart had occasion to venture into Hart's attic. Froese teased Hart about the messy state of the attic. A few days later, Froese was dead. In November, Hart received an email from Froese's account with a subject of "I'm watching" which said "Did you hear me? I'm at your house. Clean your f***ing attic!!!" Read more about Email From Beyond The Grave? What lit up the sky over Phoenix last week? Phoenix seems to be a hotbed of bizarre UFO activity. Whether it's the large flat area with a high density of population (thus providing excellent fodder for multiple observations), or the odd illusions that can happen in the desert, or some other factor known only to the aliens. A famous spate of UFO activity was recorded there in 1997, and a news broadcast recently caught what some people believe is a UFO, live on television. In 1997 and 1998, reports flooded in from all across the desert Southwest, including Arizona, Nevada, and northern Mexico. People witnessed what seemed to be a craft shaped like a boomerang, marked with between five and seven very large steady lights on the underside. The craft moved slowly and silently, and was well documented by multiple reliable sources - including Fyfe Symington, who was Arizona's governor at the time. In America, demons possess people. In Japan, that job is reserved for foxes! Fox possession isn't really all that different from demonic possession. If you're possessed by a fox, you act crazy (which may just mean that you are crazy, or that “fox possession” is a culturally-specific pre-modern way of talking about mental illness, or even that people tend tend go crazy when a fox possesses them), you “speak in tongues” (specific languages you've never been taught before, not Holy Roller stuff) and you need to be exorcized by a priest, but it's a Shinto priest rather than a Catholic one. The most common side effect of being hit with massive solar flares is that the Aurora Borealis show gets pushed much farther south than usual. Over the last two nights, people have reported seeing the "Northern Lights" as far south as New York and Washington State. The Ghost Theory blog had an interesting article recently about a phenomenon that I had not heard of before: strange sounds in the sky over Yellowstone Lake. Unlike the other recent "sky sounds" that have been fairly conclusively proven to be hoaxes, these sounds have been reported hundreds of times, over at least the last hundred years. The reports come from both inexperienced park visitors and well-established naturalists, guides, rangers, and other respected figures. The sounds happen most often on a quiet morning, when the lake is still. An observer standing on the shores of the lake may hear a sound that seems to be approaching from a distance, like the whistling wings of a flock of ducks. The sound has a distinct element of horizontal motion, as if it is passing overhead or moving across the lake. Are UFOs hiding in plain sight? 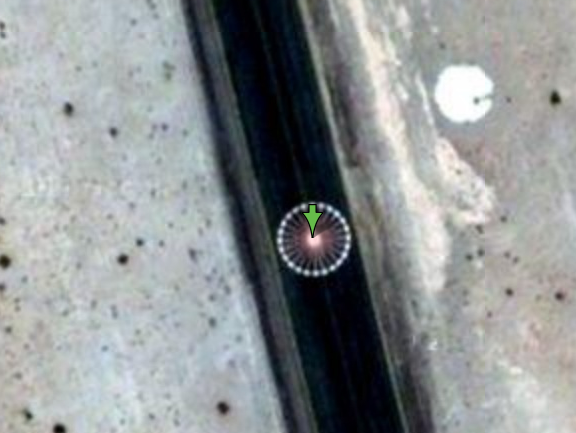 You can find some pretty interesting stuff on Google Earth if you know just where to look. Beyond the silliness you might expect (like this shark carved out of the forest at 31 59’20.53?S 152 34’18.47?E), there is also a lot of mysterious formations and shapes that some people suspect might be alien artifacts, alien communications, or even crashed UFOs. This bizarre shape was recently spotted on a military base in Arizona. It seems to be a central light, surrounded by a spoked wheel of other lights. Not unlike the "wheels within wheels" described by Ezekiel in the Book of Revelation, which has long been assumed by UFOlogists to be an early description of a UFO sighting. Could the US military be testing UFOs at the Laguna AAF Airport? Is it an odd design painted on the runway? (And if so, why?) Or could this just be a weird visual artifact?